An essay on Ender and Paul from Ender’s Game and Dune. Ender’s Game, Orson Scott Card (1985), is a story about empathy. Empathy: being able to understand how someone else feels — it is both the most elusive and important aspect of life and human relationships. Not enough of it, you end up ignoring or destroying other people’s lives; too much of it, and you end up overwhelming your own life with the burdens of those around you. Human nature demands we be selfish. At our core instinctual level, the self alone must survive. Everything else comes secondary. Thusly, the act of empathy requires effort, energy and personal sacrifice. Putting someone’s else’s thoughts and feelings and livelihood above your own is hard enough; basing decisions off of this continual process of understanding is even more challenging. That being said, humans are necessarily social animals. We need to be among others, amidst an interactive community in order to be truly fulfilled. Perhaps nothing seems more natural than a mother’s love for her children. As we grow older, this hierarchy of care and love we employ continuously changes. We come to understand what’s really important to us in our lives. We realize that this effort to forge bonds with others is the highest calling we have. The relationships we build with others come to define us and advance us. We do find meaning in working together with those around us. However, this doesn’t mean it ever becomes easy. Developing relationships always requires significant time and work. In Ender’s Game, the protagonist Ender Wiggin, is merely a child — with all the inexperience and naivety that brings with it. He has been watched and identified from birth as a potential candidate for Battle School, by the unified military forces of Earth. This is due to his precocious hyper intelligence (same as his older siblings) and its potential uses in the upcoming war against an alien threat. The buggers, a hostile alien race, are expected to return after being repelled by Earth’s previous generation. The world’s countries have called upon their collective child geniuses to lead the next war against them in space. Ender is one of the chosen children for this mission. Up to the point in his life when Ender gets called to Battle School, he’s had to reconcile himself with the personal burden of being a Third (3rd child born to a family in defiance of two-child policy due to overpopulation). Additionally, Ender grapples (physically and metaphysically) with his own sociopathic older brother Peter. Peter has a tendency to make Ender’s life a living hell, and Ender doesn’t appear to be able to effectively fight back against his methods. Valentine, Ender’s older and kinder sister, serves as a foil to Peter’s sociopathy. Val cares deeply for Ender, defending him against Peter’s psychological warfare. Both of his siblings were former entrants into Battle School themselves, tasked with using their own potential genius for military command purposes. However, each of them was sent back home. For contradicting reasons, each was determined not be fit for command; Peter for being too ruthless, and Valentine, for not having enough of it — the killer instinct ruthlessness affords and is necessary in battle. Ender, the third child among them, comes to see his own personality as a mix between Peter’s cruelly effective sociopathy and Valentine’s deeply empathic tendencies. But he feels he has the power to choose his own fate. Of course, Ender wants to to be more like Valentine. But it’s not that simple. Just before he’s sent to B-School, Ender gets into a fight with a bully at school, a recurring adversary, and defeats him soundly and brutally. It appears to be the primary reason Colonel Graff, the Battle School commander who comes to their house to take him, lists for Ender’s sudden acceptance into battle school. This ruthless drive to win against the older kid bullying him in school makes Ender a good candidate for command. He had the power to win and he wasn’t afraid to execute an unyielding strategy to attain that win. In the upcoming conflict, the human race knows they will be outnumbered, outgunned, and out of their own galactic environment in this deep space battle with the bugger force. It will take guile and a commander with the boldness to win at nearly all costs. Ender is willing to do what is necessary, for his own safety, for the greater good — even if it doesn’t feel good. Ender takes no pleasure in striking the enemy down (he internally wrestles with the morality and unseemly ferocity of his actions for years hence). It wasn’t necessarily personal or out of anger; Ender did it because it had to be done and more importantly, to end all future battles with this bully or others. Given these conditions of his early life, Ender doesn’t have a lot of reasons to be trusting of others. There was really only one person in his life, Valentine, that he could trust. His parents cared for him but couldn’t hope to understand him and his gifts. Ender’s brotherhood with Peter, the bullying at school, being a Third child, and having to be ripped away from his home life to prepare for a war he doesn’t fully understand — all serve to harden, not soften a young soul. And yet Ender has been chosen to lead, to gain the other genius B-schoolers’ mutual trust, to command them into battle and teach them how to work together. He must be charismatic, yet strong-willed; wield a killer instinct, yet be compassionate enough to lead a group of fearful children into war. And he has to become this great leader now, the survival of the human race depends on it. The stakes couldn’t be any higher. The task at hand no more challenging. Ender must bypass his own personal struggles, and the weight of Peter’s effects upon him. Before he can even begin, he has to believe he is capable of connecting with others — in a genuine capacity for mutual support and companionship (like Valentine), and not strictly for manipulative purposes to reach the endgame of winning (like Peter). He has to figure out ways to effectively earn the respect of the older kids, his teammates at battle school who resent his hyper-competence and early promotion to squad leader. All of this while battling through his own self-doubts about the very nature of the mission. Ender’s greatness is borne out of simple necessity: he learns the art of leadership through empathy— of listening and trusting the other kids, his teammates. He tries to learn from them just as much as they learn from him. The result is a highly functioning and effective team. They are able to adapt to increasingly difficult battle room simulations, their own personal challenges, the psychological experimentation from those running the school itself, and ultimately the real battle. From these inborn empathic responses to others, Ender’s leadership style is developed. Essentially, it is a decentralized form of leadership, comprised of extremely fluid channels of communication and reliant upon supreme trust between teammates. Ender wisely starts from the outset being self-deprecating — he levels with everyone, he knows he’s been promoted to squad leader too quickly. He voices his own insecurities about himself and about the school leaders’ endgame. He understands it is designed to pit the other students against him. It’s an experiment, partially out of necessity, to see how Ender deals with this adversity and to see if he can handle leading other kids older than him and many almost matching his genius. Ender starts by getting a read on everyone’s abilities and then lends credence to their own individual egos by constantly opening up the floor for suggestions on team strategy. Ender values the diversity of opinion these kids from all over the world can offer, each with varying levels of experience and perspective. Simply put, he wants all potential ideas laid out before them, and together, they can formulate a strategy from the best ones. By starting out the command process with this kind of collective brainstorm, he earns some of their respect and gains access to their thoughts & ideas freely given. This process seems intuitive, but it might be difficult for seasoned leaders to do. Individuals who think they know best might not even consider the fact that someone in the same room, on the same team as them, could actually have a better idea than them. And recognizing it, then consciously swallowing the pride might be the hardest part. An empathic response, from genuine curiosity and willingness to learn, is necessary in order to unlock those thoughts. Ender puts his ego aside and turns followership into a collaborative process. The team becomes a cooperative where the leader becomes the one with the best idea for that moment (often Bean, his 2nd in command and with a hyper genius to rival Ender’s own). The best leaders listen more than they speak. Ender is a good example of this. By using the newfound knowledge from this practice to unify the team’s objectives — he successfully earns the loyalty and respect of those he is leading. In addition, Ender is able to balance the embodiment of authority he must represent, with the friendships he desperately wants & needs to forge with these other kids. By earning their goodwill at the start, being among them and establishing this lateral hierarchy in which ideas are the only standings — he doesn’t sacrifice any respect by also becoming their friends. This companionable respect borne through empathy is essential to Ender’s next step in the development of his team — establishing individual trust and autonomy. Even at a young age, Ender understands some of the nuances within human nature. It is much easier to get someone to do something you want them do, if they think of the best way of going about doing it. In the same vein, sometimes you can’t teach someone anything, they have to learn through their own experience — even if causes them pain. The staying power of ideas borne from within is stronger than any notion from without. Humans are stubborn and irrational, and it’s integral to leadership to understand these facts. Given these conditions, once Ender comprehends the kind of talent that is around him, he simply plays off that strength — he gives his squad members a measure of independent autonomy. He believes each squad member should learn and grow the same way he has — by experimenting and working it out themselves. The core strategy involves Ender collaborating with the others to identify the objectives which needs to be accomplished inside of a simulated mission: get the best positioning, be defensive and then capitalize on offensive opportunity when it presents itself, move as a unit to cover each other, and ultimately get to the enemy’s gate to win the game. Ender has each of the “toon” leaders formulate an individual, often improvisational, strategy to execute amongst their smaller groups — each leading to the larger objectives. Once the objectives are set and known to all, Ender trusts Bean and Petra and Alai and Dink to be able to develop their own personal strategies among their squads to achieve them. Often the plans meet with the enemy and the conditions of the field of play such that the original ideas no longer hold water and strategies have to adapt quickly to salvage victories. Ender understands the importance of improvisational freedom and trusts the toon leaders to make the right choices in the moment. This autonomy affects more credibility to Ender’s command, but more importantly, it leads to better tactical and strategic outcomes for the team. With each leader having the freedom to bring their own original ideas to bear, it allows for accelerated growth of the team’s abilities. On the flip side, the responsibility of experimentation without interference from Ender also means personal responsibility for any failure. Each squad leader’s competency and accountability allows for the disparate, individual strategies to coalesce into one grand, winning strategy. To an outsider, this might appear as singular, overarching brilliance from the head commander. But the keys to ultimate victory lie with each of the components coming together. The brilliance is in Ender’s creative blueprint for teamwork in which this apparent chaos becomes victorious harmony. In each bout within the zero-grav battle room, Ender’s squad uses this decentralized strategy to exemplary success. He soundly defeats every challenge, even winning against increasingly unfair odds as the battle school leaders progressively test his mettle. Ultimately, this framework for leadership leads Ender, his team, and humanity to victory and survival against the buggers. The methods Ender employs with regard to communication, mutual respect, trust and autonomy are certainly worth emulating inside of any communal endeavor. Ender’s Game showcases the power of the empathy-empowered team and of the skillset for the kind of leader to bring out the best in one. Dune, Frank Herbert (1965), is a science fiction tale about a boy, his destiny, and journeying through the arduous, shifting sands of fate. Dune is a tale of greatness being borne of extremely disadvantageous circumstances. Our young hero, Paul Atreides, from the outset is surrounded by vicious killers, political operatives, poisoning assassins, the arrogance of his own position and the inexperience of adolescence. And also giant sandworms within the great deserts of Arrakis, his new home. After tragedy strikes his royal family and he is thrown into the wilderness of this strange world, he is alone with only his wits and his mettle as resources to survive with. He has to grow up quickly or risk being destroyed by the threats on his every side. Paul is smart, but he’s also a prince, and a young boy. Initially, he is arrogant and certain mental habits are imbedded. When first arriving on Arrakis, he fears the family’s displacement there from the familiar confines of their lush home planet has put them at a severe disadvantage. They are strangers in a strange land. Paul fears for his father’s safety with so many adversaries on the new world and their inexperience with ruling the people there. Paul has to become comfortable with mere existence on Arrakis as a new home — sans the abundance of water and other amenities, chief among them being safety — their old home gave them. He has to embrace all his discontent and move forward with his learning to become a future king. Later after everything has changed, when he finds himself trying to survive the harsh desert wilderness among apparent savages, he must learn the value of the very moisture within his body. Paul’s every experience on Arrakis is forcibly humbling. 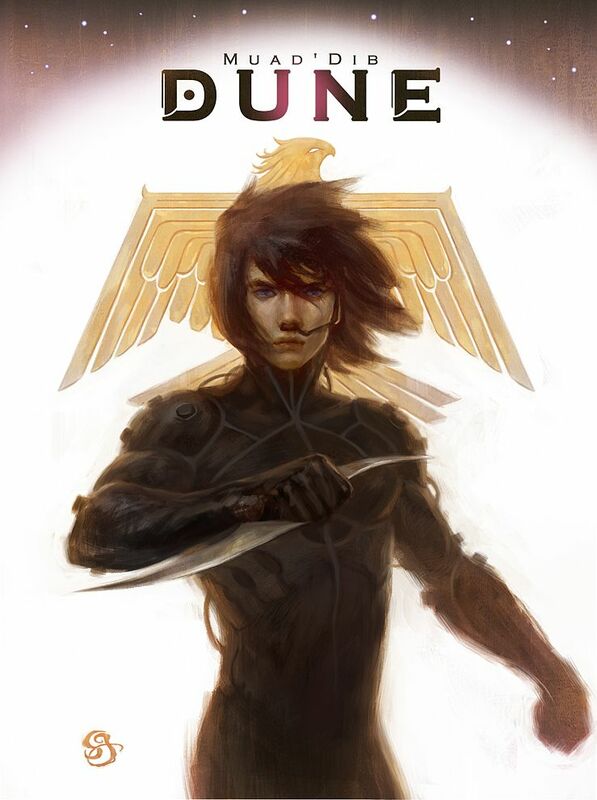 His time with the fremen, just him and his mother and his limited time as royal understudy, serves as a continual process of opening his mind, unlearning what he thought he knew about the world and unraveling just how much he is capable of. The desert itself represents his greatest challenge. Out there among the sands, Paul must adapt or die. He does so but not through manpower, or ruthlessness, or strength of will alone. He does so by using empathy and an understanding of his available allies, known enemies and the feedback from within his environment. Paul steeps himself into fremen culture — a tribal society which values survival and stoic strength above all else. He gets to know the people and examines deeply the ways of their desert traditions. Paul must become a well-rounded thinker and a fierce but understanding leader in order to avoid ruin at the hands of his enemies or the sands. He draws on his past education of political operations, and combat, and the methods of ruling, in order to thrive in this perilous situation. He is able to effectively use every relevant mental tool as his disposal in these ways, while also earning the trust of the foreigners. Paul is wise in that he knows just how much he doesn’t know. And so he listens and follows them with grace. The series of personal and familial disasters he endures harden him and fill him with an indomitable resolve. Initially, he concerns himself mostly with mere survival using the resources he has at his disposal. Later, as he learns of the true power within him — he comes to face a fearful destiny. But Paul realizes the fruitless impossibility in trying to become fearless before all this — human nature demands such responses and it’s necessary for our own well being. Instead he uses the fear. Paul faces all these fears with a common tenet: respect. Fear is the mind-killer. Paul respects the Fremen, that is how he is able to learn their ways and earn their trust. He respects the Harkonnens, that is the only way he can hope to outmaneuver them in their devious feints-within-feints stratagems. He respects Gurney Halleck and Duncan Idaho and Thufir Hawat and Stilgar, even when they can be condescending and harsh and even cruel in their training & interactions with him. But he understands why this must be, the harshness of their training breeds mental strength. He trusts their ending objectives even if the means are disconcerting. He respects the Bene Gesserit, that is how he withstands the gom jabbar, how he quickly learns their methods of compulsion to use to his own advantage, and ultimately how he comes to embrace and alter his fate being the Kwisatz Haderach. Most especially, he respects the desert, the sandworms, the value of water. This is how he survives and masters the ability to ride the worms — to use the desert itself, its mysteries and the source of the Universe-controlling spice to his own, and his new people’s, advantage. This Tao of mutual respect, constant learning, and empathic channeling amongst his ‘followers’ grants him a righteous ascent to a newfound rulership. Paul Atreides retakes his rightful place at the throne not through inheritance or politics, but through a sincere respect for the truth of his new world. He experiences a reeducation and a rebirth at the hands of harsh circumstance and he becomes a better leader of men because of it. Both Ender’s and Paul’s methods for empathic leadership bring them well-deserved victory and loyalty among their companions. There is considerable growth and hardships along each of their hero’s journeys. Neither of them escape their gauntlets without some damage to their souls. Each experiences considerable pain in the deepest parts of their hearts for those lost along the way. However, it’s all necessary — the challenge, the fear, the relentless adversaries they face are all requisite in order for the greatness within each individual to be borne. For each of them, there is this common thread of the interrelationship between intelligence and morality. The core of their identity as characters is housed amongst these pillars. Their intelligence leads them upon great stages to perform upon; their moral hearts guide them to righteous choices borne of love for their fellow Man. With so much uncertainty in their motivations, Ender is deeply reluctant concerning what must be done to the buggers in their war. Subsequent to the xenocide, Ender devotes the rest of his life to righting the unwitting wrong he has committed and now understands with clarity. Paul carries the weight of prescient visions of the aftermath of his victory on Arrakis, with a brutal holy war waged in his own name, Muad’Dib. He consciously chooses a strategy ensuring he prevents this future reality, saving innocent blood to be shed in wild and misguided fanaticism for him. These are prime examples of the synergistic effects of intelligence and morality resulting in righteous outcomes for our heroes. Heightened levels of intelligence has tremendous evolutionary benefit. It accelerates learning, solves/lessens/prevents the problems we encounter, and makes life easier when applied in every pursuit. However, in some circumstances it can dull the empathy and blunt the moral responses we are commonly drawn to in our communal societies. Raw intelligence can allow one to step back from inconvenient entanglements of personal relationships, look at the bigger picture and make decisions. These choices, while technically logical, can be damaging to some and to the benefit of the majority or a specified group. At surface level, it can seem that intelligence and morality often come into conflict. On the other hand, immense intelligence can also deepen the emotional responses and the empathic understanding of an individual. A person of intelligence will no doubt see the value in loyalty, the strength in being indispensable to the community, the virtue of self-sacrifice. There is considerably greater value in the collective work of conscientious individuals coming together, both in scale and impactfulness. This has new implications for decision making and can sometimes run counter to logical choices. When one is seriously concerned about the physical, emotional and spiritual well being of someone outside of yourself, or bloodline, it can put you in avoidable danger. However, Ender and Paul both believe working within the collective and forging bonds with your fellow man leads to the best outcomes. But more importantly, it is their duty; it is the right thing to do. Emotional intelligence requires great effort, commitment and can seem to be cumbersome. However, this is what separates us from animals. It defines our sentience and lends itself to the aspects of life that are most important: community & love among our fellow human beings. All this being said, I think it’s important to consider the incredible forces of intelligence and morality Ender and Paul wield and how they use them. They each consider emotional intelligence to be integral to their individual missions and to their own personal telos. It is critical for them to connect with those around them on a level of mutual respect / trust and love.